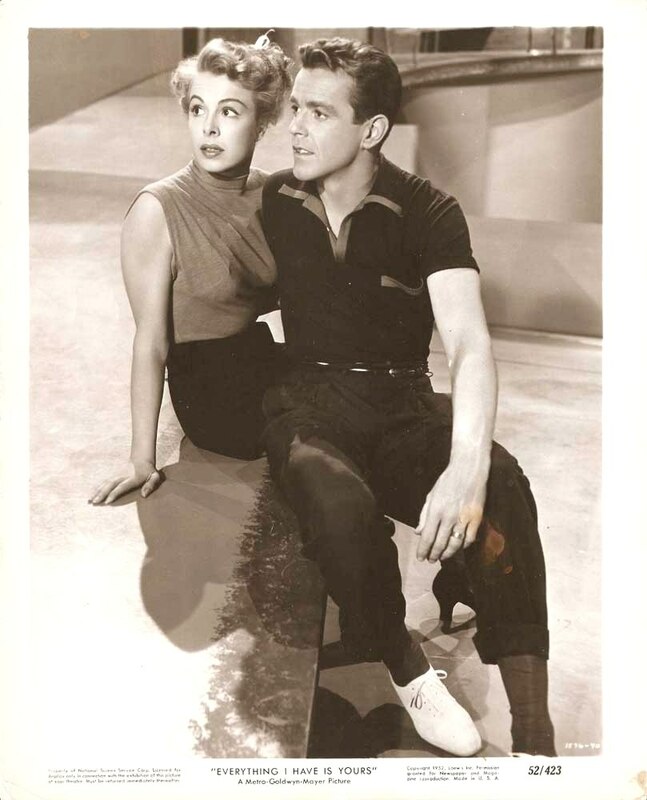 The Warner Archive has just released a lovely remastered print of the MGM musical EVERYTHING I HAVE IS YOURS (1952), starring Marge & Gower Champion. This film was one of a relatively small number of MGM musicals I'd never yet seen, and I thoroughly enjoyed it. Marge and Gower play the married dance team of Pamela and Chuck Hubbard. On the successful opening night of their first Broadway show, Pamela unexpectedly learns she's pregnant and must stop dancing immediately. Chuck continues in the show with Pamela's understudy, Sybil (Monica Lewis), and months later Pamela gives birth to a little girl, also named Pam. Chuck wants little Pam (Mimi Gibson) raised in the country, and as time passes he resists all of Pamela's pleas to do another show together. Eventually conflict over Pamela's career, along with the interference of Sybil, leads the Hubbards to divorce. 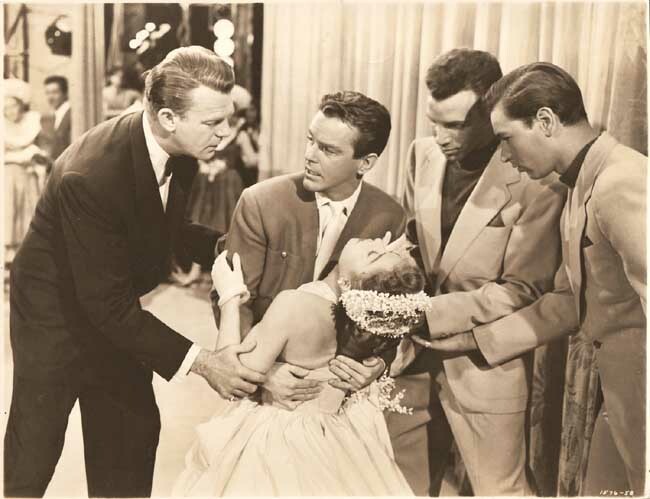 Producer Alec Tacksbury (Dennis O'Keefe) quietly loves Pamela, while Sybil tries to put the moves on Chuck, but the Hubbards really just want to be together. Getting to the point of reconciliation is another matter. Although the soapy plot in the last third of the film is a bit of a downer, the movie as a whole is sheer bliss for dance fans. Marge and Gower perform a plethora of dance numbers which are simply terrific. 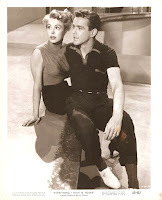 My favorite was "Casbah," but there's so much more, choreographed by Gower Champion and Nick Castle. Anyone who loves dance or MGM musicals should be sure to see this film. It's nice to note that star Marge Champion recently turned 96. Supporting actress Monica Lewis passed away earlier this year at the age of 93. Monica has ample screen time, including the chance to sing and dance, although unfortunately the character she plays isn't very nice! Gower is charismatic and attractive, and he's also amusing as a hypochondriac susceptible to suggestion. O'Keefe has little to do but stand around looking handsome, but that does add something nice to the movie even if the part isn't much! The supporting cast includes Eduard Franz, John Gallaudet, Elaine Stewart, Maudie Prickett, and Jean Fenwick. EVERYTHING I HAVE IS YOURS was directed by Robert Z. Leonard and filmed by William V. Skall. It runs 92 minutes. 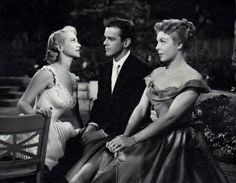 The Warner Archive print is bright and attractive, showing off the colorful set designs and the Helen Rose costumes to perfection. The DVD includes the trailer.